The latest and greatest tower defense game is here. Sentinel 2: Earth Defense by Origin8 is a very well designed sequel to the popular Sentinel: Mars Defense. The mission to save the mining colony on Mars has failed and all personnel were lost. Two months later, unidentified ships were picked up on radar heading towards the Earth. In preparation for battle, your ship, the Sentinel, was given a full weapons upgrade and is now fitted with deadly weaponry. Your job is to defend the Earth from the alien invaders. 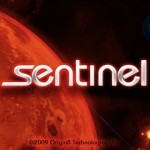 Sentinel 2 is a great sequel to the first Sentinel. It has the same graphics and controls as the original game. There are many things that have changed, though. All for the better, I think. There is a wider variety of aliens that you must fight against, including some that can teleport when struck by the slowing towers. There are also more weapons to choose from. There is now a booster tower that boosts the power and range of the other defenses around it. There is also an ion tower that can be very useful in fighting all types of enemies. The use of repair drones to harvest and repair for you has also been improved upon. Now, when you buy these drones you can specify what you want their priority to be. You can tell it to repair your gates as a first priority or to harvest only and never repair. One of the biggest enhancements to this version of Sentinel is the addition of the weapons on the Sentinel itself. Now you have a whole new line of defense. There are four different weapons that your ship can provide. First, you must charge them, though. At the end of each attack wave, energy is beamed up to the Sentinel from one of your gates, but only as long as it is not destroyed. You can also buy drones, similar to the repair drones, that have the ability to synthesize energy for your ship’s weapons. There is a button in the bottom right corner of the screen that allows you to toggle back and forth between the towers you place on the ground and the ship’s weapons. In this second version of Sentinel, Missions were also added. These are short games with specific objectives. Many of them involve you keeping invading aliens at bay with some specific limitation. For instance, in one, you must defend your gates without any monetary resources or towers at your disposal. Luckily, you only have to survive one wave of attackers. Each time you complete one, the next mission is unlocked. There are a total of 8 missions. Another new addition to Sentinel 2 is the integration of OpenFeint into the app. When you first launch the app, it asks whether you want to allow Feint to run or not. OpenFeint is, according to their website, “The premier Social Platform for iPhone games made by Aurora Feint with friends lists, social profiles, leaderboards, chat rooms, facebook and twitter integration, cross-promotion, achievements and more!” If you choose to allow OpenFeint to run in your app it will allow you to access chat rooms and leaderboards directly from your app. You can also import friends from Twitter or Facebook. Then, you can allow your friends to see what you are playing and the achievements you get, as well as keep track of their stats as well. The biggest complaint I have about it is that after letting OpenFeint run for awhile on my iPod, I decided to turn it off and could not figure out how to do that. So, make sure you turn it off from the beginning if you are not interested. Sentinel 2 has 4 maps to defend. You can play in assault mode where the attackers come in waves or endurance mode where they come continuously. There are also 4 levels of difficulty. I appreciated that the easy mode was, in fact, easy. So many games are way too difficult even when you play in the easiest play mode. With so many play options and so much variety, Sentinel 2: Earth Defense is sure to be a long term favorite. Sentinel by Origin8 is a great tower defense game worthy of competing with Tap Defense and Fieldrunners. The game takes place in the year 2029. Mankind has established a mining colony on Mars. However, after only 2 short years in operation, a distress call is sent back to Earth. The message cannot be read except for the word “invasion.” You are commander of the ship Sentinel, which is sent to Mars to help. Once you arrive, you must help defend the colony from the alien invaders. When you launch the game, this story is told to you with scrolling script in similar a style to Star Wars. At once, you can see that the graphics are great and the music fits the game very well. 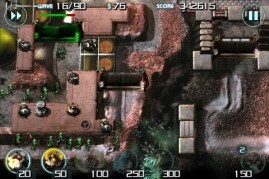 Sentinel, like many other tower defense games has a fixed path that the enemy attackers follow. However, there are 3 different maps, 2 different battle modes, and 4 difficulty levels. Only the first map and battle mode are unlocked in the beginning. To unlock the others, you must prove yourself by defeating the ones that you have. The two battle modes are Assault and Endurance. The main difference between the two is that Assault has a fixed number of waves of attackers, Endurance does not. The second and third maps have the added difficulty that there are two places on the map where the aliens enter. You must defend two different pathways. Your money is a very limited resource so be sure you only build as much as you need. The money that you save will accumulate interest at the end of each attack wave. To defend your colony, you have the typical choice of 5 towers (laser, bomb, slow, beam, and sniper). The sniper tower is locked in the beginning. To place a tower on the screen simply drag it to the spot where you want it to be. As the game gets more and more difficult, you can upgrade your towers to make them stronger. The defense that Sentinel adds that I have not seen in other tower defense games is barriers. There are physical barriers in the way of your attackers. If they make it past all of your defense towers, they must still break down the barrier before they can invade your facility. These barriers are quite strong and are flanked by sniper towers. Sometimes they serve as a good place to trap your enemy and kill them. However, the enemy will break them down over time (Some more quickly than others). This is where the second unique trait of this game comes in; your repair drones. Repair Drones are fairly expensive, but they automatically find weakened structures and repair them. They can help your barriers stand longer. If you have no repairs to do, the drones will mine for you to get more money that you can use to buy more towers. You can only have up to 3 repair drones, and sometimes even with three the repairs happen too slowly to keep up with the damage being done. Another feature that I found I really liked was that before each wave of enemy attackers, the app flashes on the screen what type of attacker is approaching. This warning gives you a chance to prepare and upgrade your defenses with those that work best against that particular attacker. Sentinel is a very well designed game that is quite challenging. It is a lot of fun to play and has lots of options to keep you coming back for more. 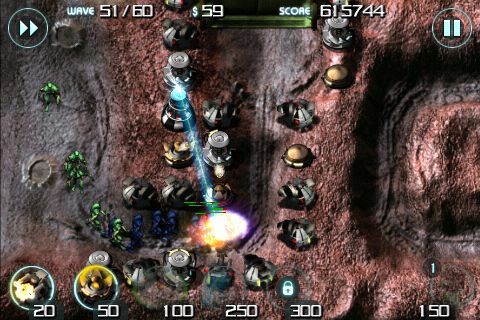 Sentinel is $4.99 in the iTunes App Store.